I wish I had more pictures to show you but I already gave them to my friend. 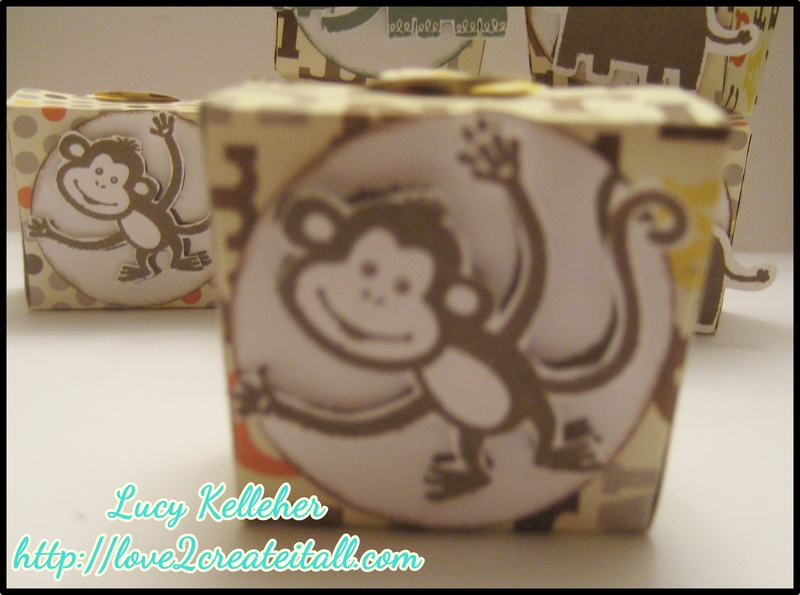 To make these cute little party favors, I used a paper pack from Close to My Heart called Babycakes. 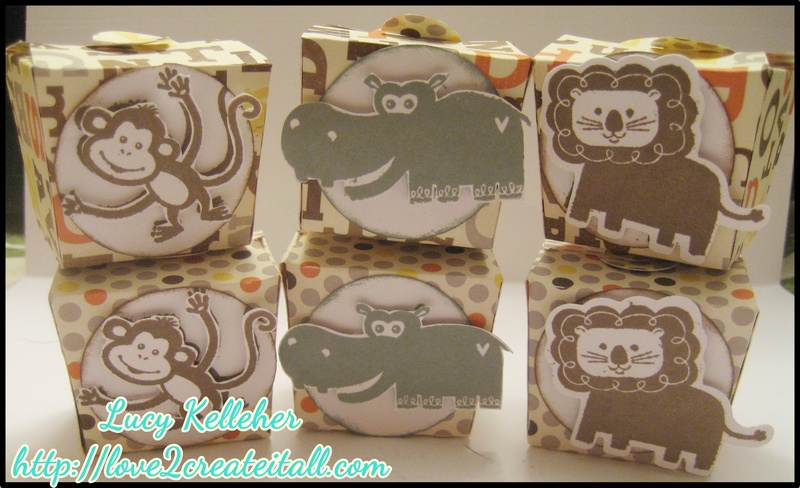 I used the Art Philosophy Cricut cartridge to cut out the little take out boxes as well as the circles behind the animals. The takeout boxes were cut at 7″. You can find the image on page 24, A4, Shift, Font Layer, < Dragnfly >. The circles can be found on page 21, A1, < Circle1 > and were cut at 2″. The cute little animals came from the Artbooking Cricut cartridge. The stamp set Wild Wonders coordinates with this cartridge and so I was able to cut out the rhinocerous and the lion using the cartridge. I edged each circle w2ith Chocolate ink to help give them a bit of dimension. 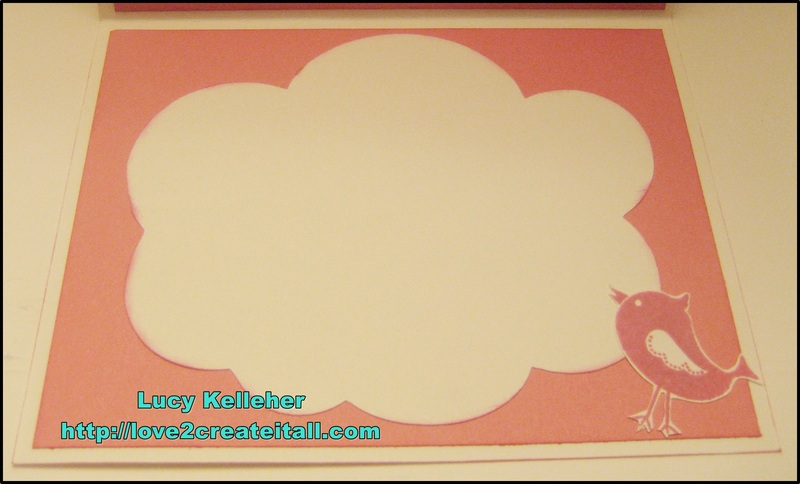 Please visit my blog at Love 2 Create to check out the other projects I made for the baby shower. It’s “Sentimental Saturday” here at CricutDIVA! 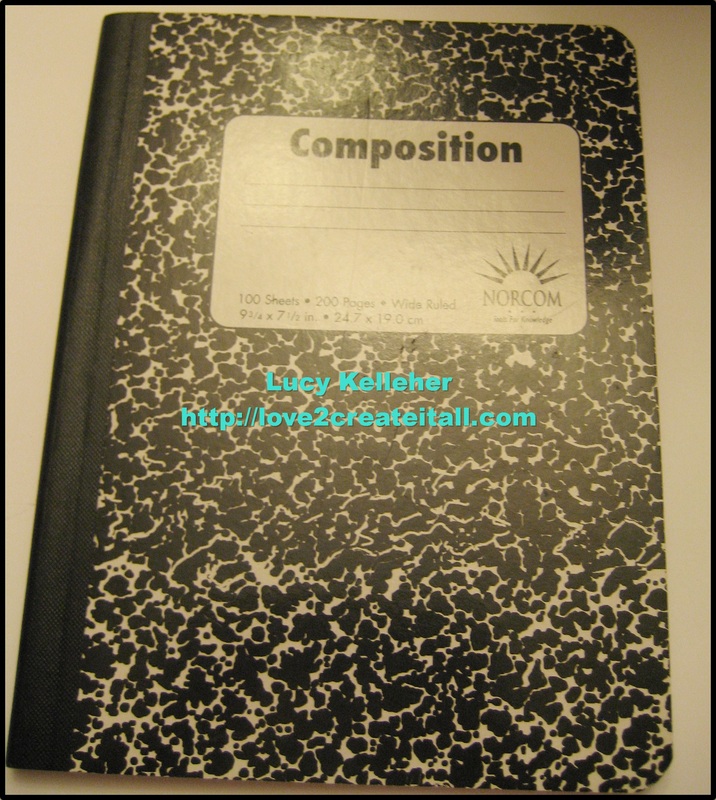 For my project I altered a black composition notebook for you – LOVE doing these! So this is what the Composition looks BEFORE I alter it. Now some people don’t do the inside of the composition books but I just don’t like the way it looks so I always alter the insides as well. 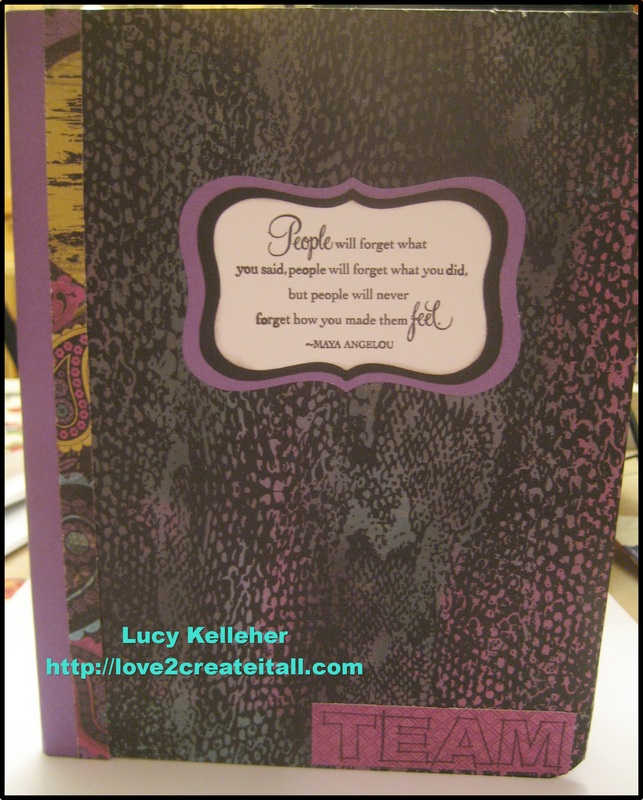 I used a paper pack called Laughing Lola for my notebook – I just love the colors in this paper pack ESP the purple one which is called Gypsy. For the sentiment on the front cover I cut the mat using the Art Philosophy Cricut cartridge. You can find the image on page 65, E5, < Rctngle8 > and was cut at 2″ x 3 1/4″, 2 1/4″ x 3 3/4″, and 2 1/2″ x 4″. 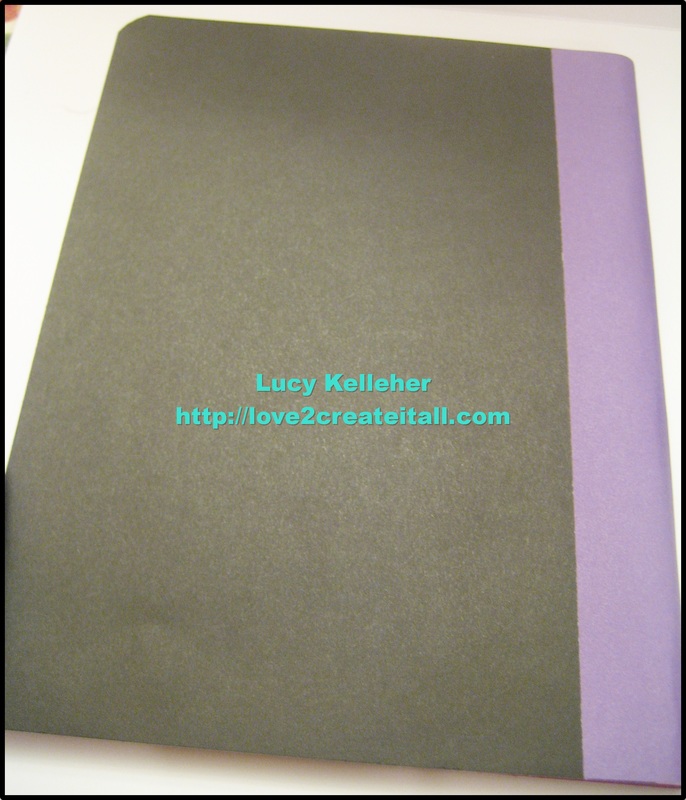 I always use a solid dark colored cardstock for the back of my notebooks instead of a patterned piece of paper because it is less likely to rip AND it will help cover any spots or dirt picked up. So for the inside of my notebook, I always create a pocket so that I can put in any additional notes or papers. Though it’s probably difficult to tell from these pics, there IS a pocket that opens up. 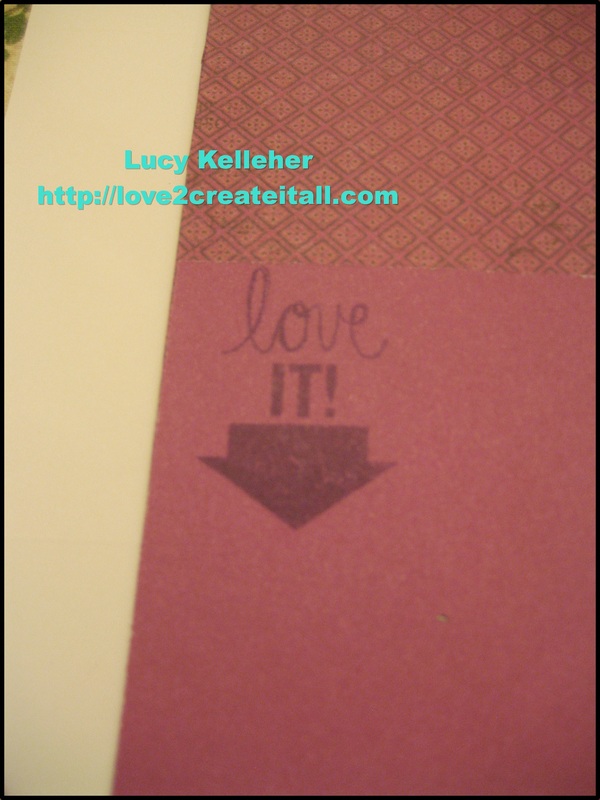 I stamped the words “love it!” and “noteworthy” using stamps from the All the Details stamp set in Black and Gypsy inks. The mini banners were also cut using the Art Philosophy cartridge. It can be found on page 68, E8, < Banner1 > cut at 2″. These words came from the “All the Details” stamp set. Finally, I stamped the word “TEAM” on the bottom right using the Framework Alphabet. I will be using this notebook for notes I take during meetings with my networking group. No, it’s not Halloween … yet! I was just feeling Hallo-weenie when I started to create this project. It’s really never to soon to get started on those holiday projects right?? 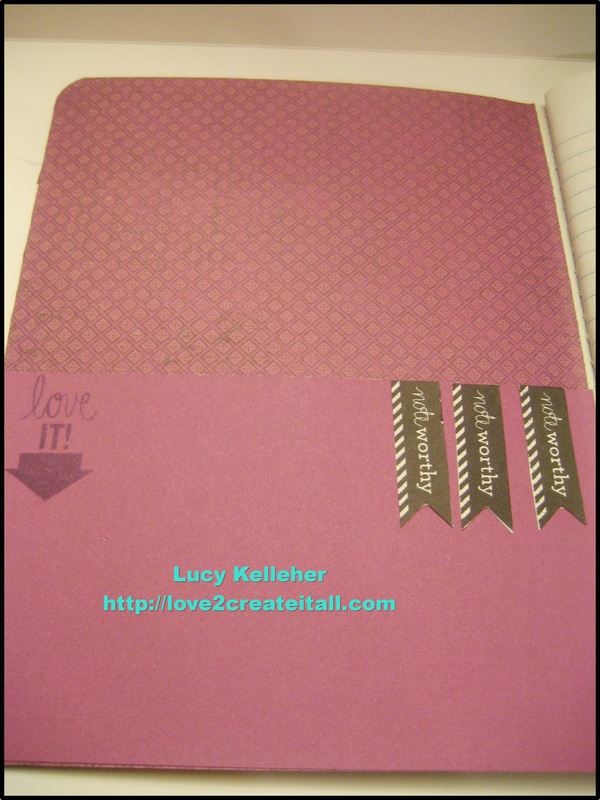 To make this 12″ x 12″ layout, I used a paper pack called Sarita. I thought the colors would work really well for Halloween. I then used the Artbooking Cricut cartridge to make all my cuts. All the cuts came from pages 70 and 71 of the booklet. They were each cut at 11″. 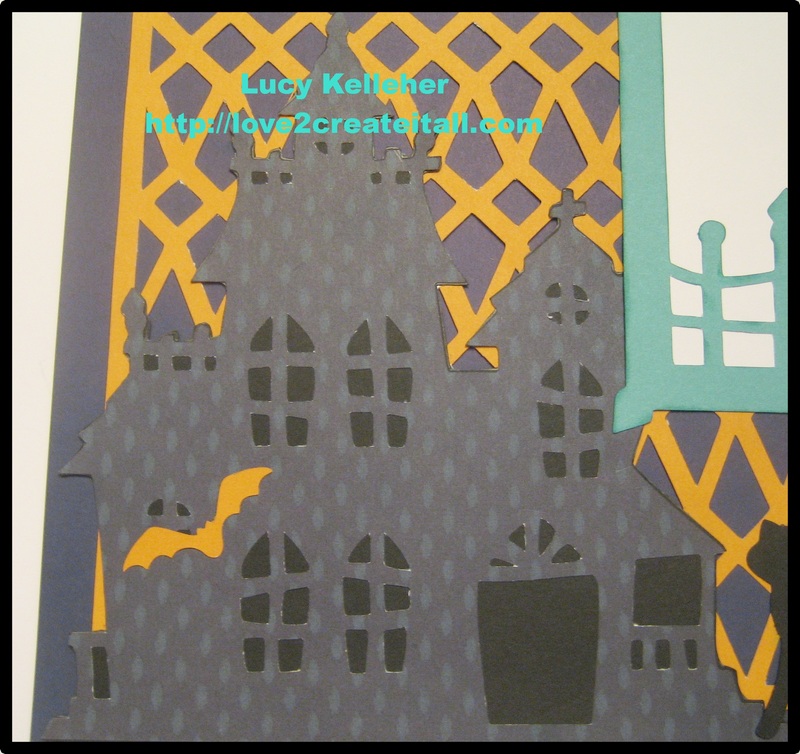 The haunted house cut as an overlay but I didn’t like that you could see through the house with the background that I had cut, so I took some black cardstock and matted the back of the house. I edged the window photo frame with Lagoon ink to give it a little extra dimension – I’m not sure you can tell from the picture though. 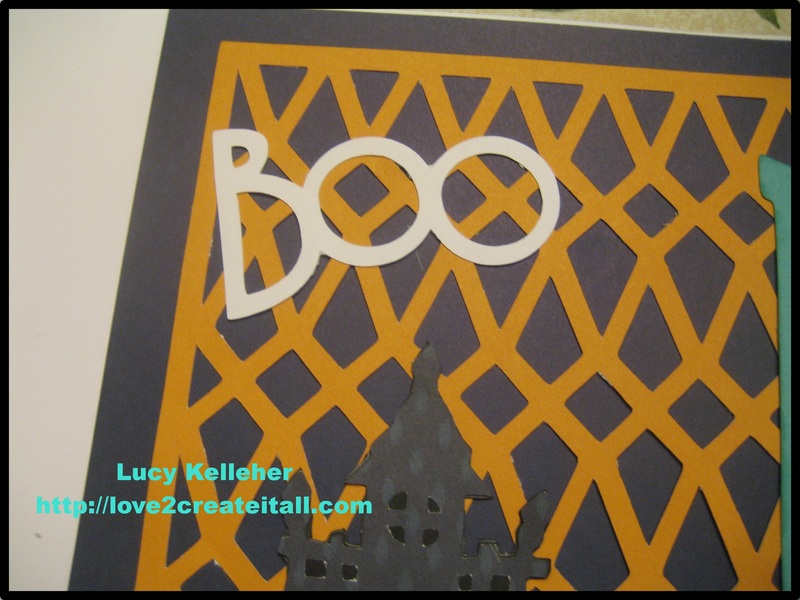 Have you started any of your Halloween projects yet? 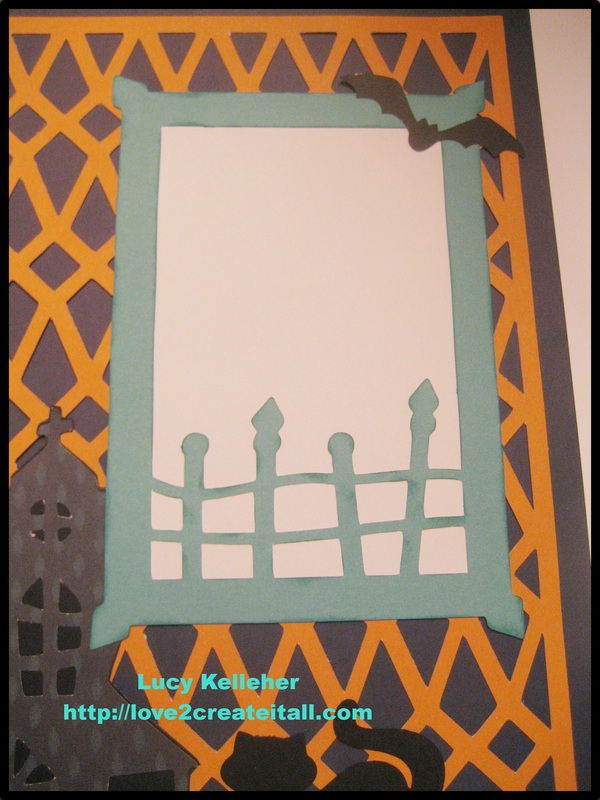 Stop by my blog at Love 2 Create to not only see this project but another 12″ x 12″ Halloween layout that I have created. I’m your designer today and I bring to you … a birthday card! I don’t know you but I am always in need of birthday cards. So I decided to make a “girlie” one. I made an A2 size card measuring 4 1/4″ x 5 1/2″ so it would fit in a standard size envelope. 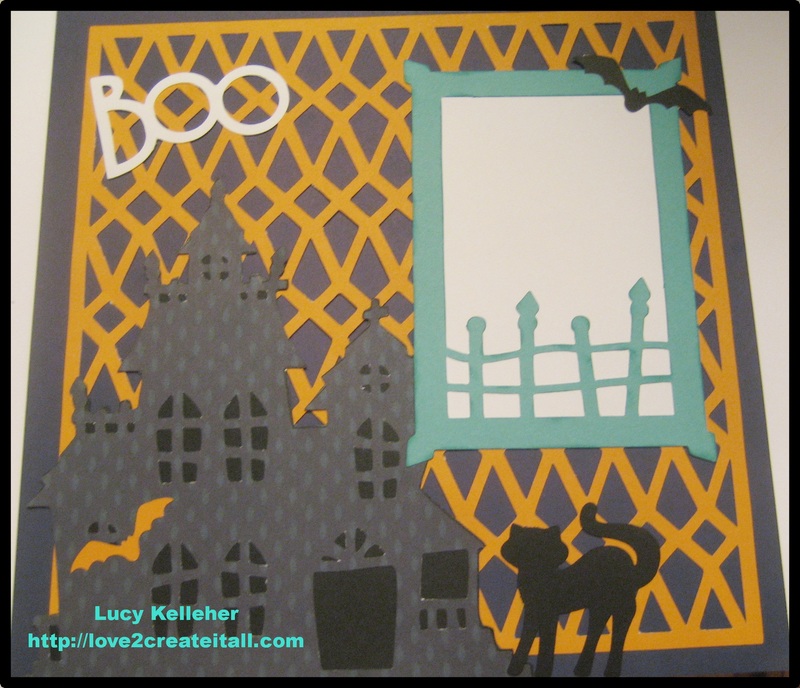 I took some Cotton Candy cardstock for the first layer of the front and insides of the card – cut at 4″ x 5 1/4″. I edged each mat with Cotton Candy ink. For the front of the card I used the new Artbooking Cricut cartridge from Close to My Heart. The number frame can be found on page 86, E9, Photo Mat 2, < Happy > cut at 4″ using the Real Dial Size key. I used our Chantilly paper pack. 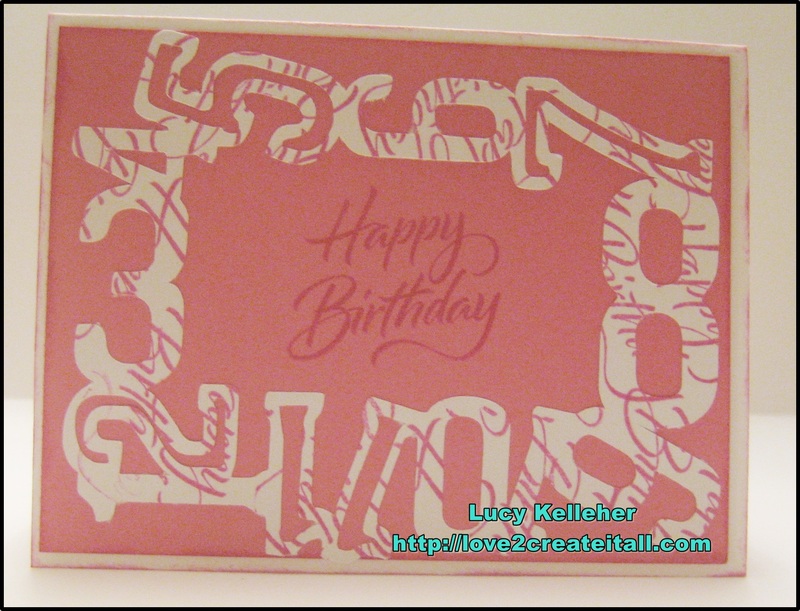 I stamped the sentiment “Happy Birthday” using Cotton Candy ink which is a coordinating color to the pack. The sentiment comes from the Joyful Birthday stamp set. I really like also designing the inside of my cards as well so for the inside top layer I used the Create-a-Critter 2 Cricut cartridge to cut the sentiment “Make a Wish”. You can find this image on page 75, E7, Shift, Phrase, < PrtyMky-s > cut at 2 1/2″. For the bottom layer of the card, I cut the word bubble using this same cartridge. 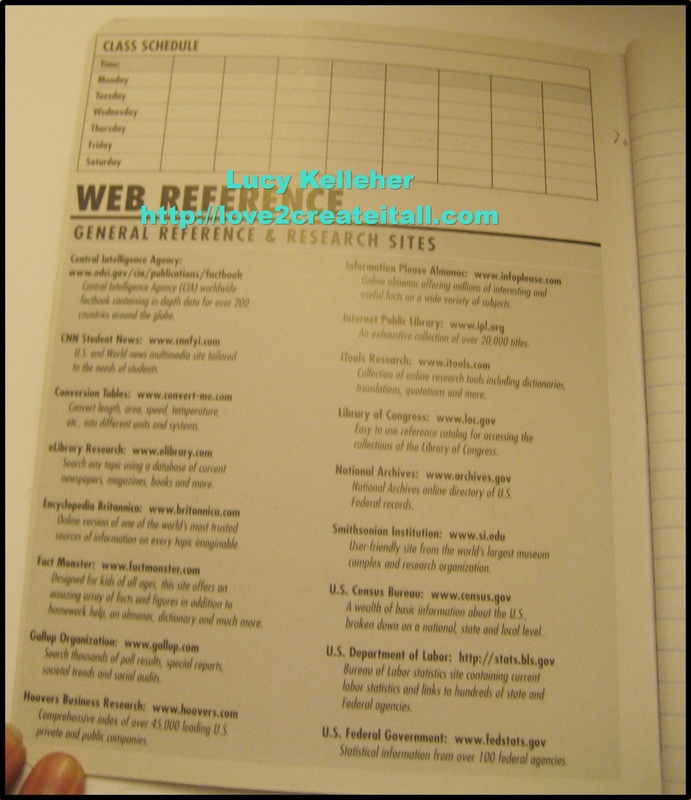 It can be found on page 75, E7, Phrase, < PrtyMnky > cut at 3 3/4″. The little bird in the right hand corner comes from the Hello Blooms stamp set and was also stamped with Cotton Candy ink. 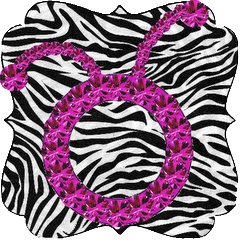 Please visit my blog at Love 2 Create – would love to have you stop by and visit. Well it’s “Sentimental Saturday” here at CricutDiva and I decided to make a birthday gift “check” holder! Yes, you heard me correctly, it’s not a gift “card” holder, it’s for checks! Believe it or not, there are still people out there who still send checks to their family and friends instead of gift cards to celebrate birthdays, graduations, etc. Soooo, I give to you my very first Birthday Check Gift Holder! This card measures 4″ x 9″. Now I know that’s not a standard card size BUT I wanted to make one big enough that you could insert your check (or money order or whatever) in it without folding it up. Also, I found a set of 25 envelopes at that measure 4 1/4″ x 9 1/2″ for only $2!! That means the envelopes were only 8 cents each! They were in the Clearance section where I just LOVE to shop in – I am always finding great deals like this. For the front of the card, I cut my designer paper (Later Sk8r from Close to My Heart) at 3 1/2″ x 8 1/2″ so that I would have a nice margin around the outside. I then took the zip strip at the top of the paper and cut it to size. It measures 1/2″ and then I cut it down from 12″ to 9″ to fit across the length of my card. I cut the sentiment mattes using my Art Philosophy Cricut cartridge. You can find this image on page 65, E5, < Rctngle8 >. I cute 3 sets – one each at 2 1/4″, 2 1/2″, and 2 3/4″. I used White Daisy, Pear, and Lagoon cardstock for my papers. 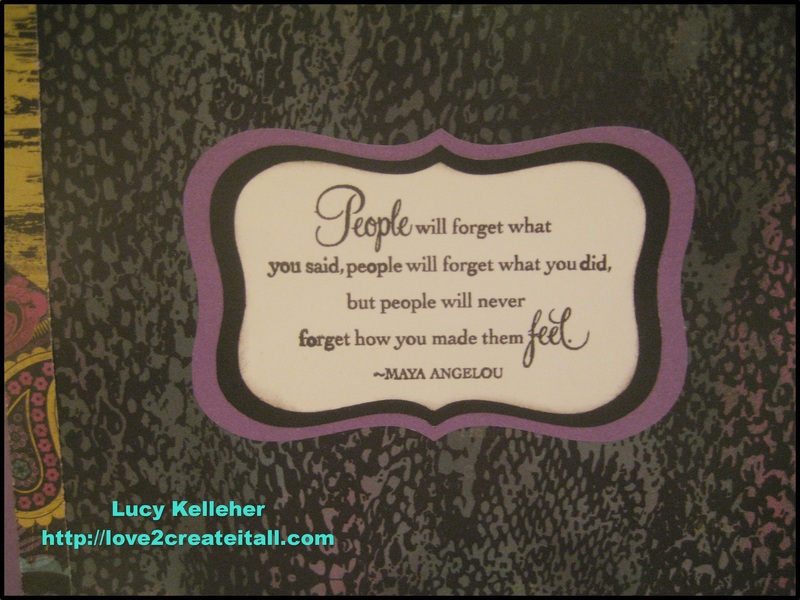 The frame that I stamped in Lagoon ink came from a stamp set called “Frame It Up“. The sentiment “Happy Birthday” comes from the “Perfect Fit – Birthday” stamp set. The sentiment was originally one long line but I cut the sentiment into 2 words and that way I could stack the two words on top of each other. I love that about acrylic stamp sets! What I love about both of these stamp sets is that they both coordinate with the Art Philosophy cartridge which means NO … MORE … FUSSY … CUTTING for this crafter! For the inside of the card, I cut another piece of Lagoon cardstock at 2″ x 9″ so that the background would not be just a plain white surface. For the bottom pocket, I cut a piece of White Daisy cardstock at 2 1/2″ x 9″ and adhered it using Scor-Pal tape. I only put the tape on the bottom and sides so that the top would be open. I then a cut a piece of the designer paper at 2″ x 8 1/2″. The three sentiments come from the Perfect Fit – Birthday stamp set referenced above. I cut the circles using the Art Philosophy: page 21, A1, < Circle > cut at 1 1/4″ and 1 1/2″ using White Daisy and Lagoon cardstock. Well, I guess that’s all I have for you — this was really easy to make once I figured out the measurements! Thanks so much for stopping by and leaving a comment. You can also visit me at my personal blog – Love 2 Create – by clicking here. Have a wonderfully crafty day! This is my first post as a DT member for CricutDIVA and I’m very excited to be a part of the team! 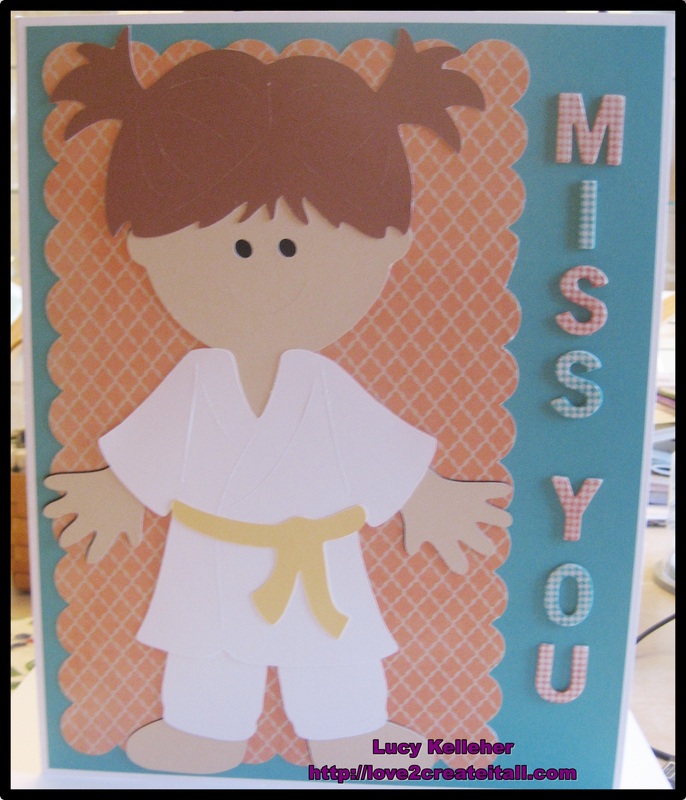 My project for you today is actually an over-sized card that I created for one of my Aikido students. She broke her leg while riding her scooter and will not be able to train for at least 6 weeks. She comes every week to watch while her sister trains with the rest of the class. We are definitely missing her on the mat and so I created this card for her that all of the students will sign to let her know. This card measures 9 1/2″ x 12″. I wanted to make it big enough so that the other students had room to write in it for her. 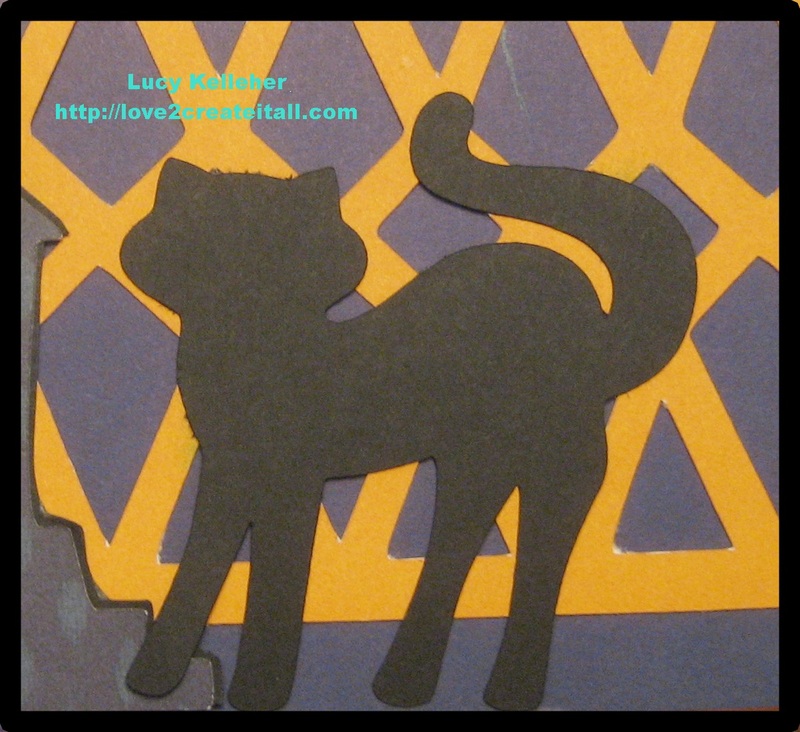 I used two Cricut cartridges to make this card: Everyday Paper Dolls and Art Philosophy. 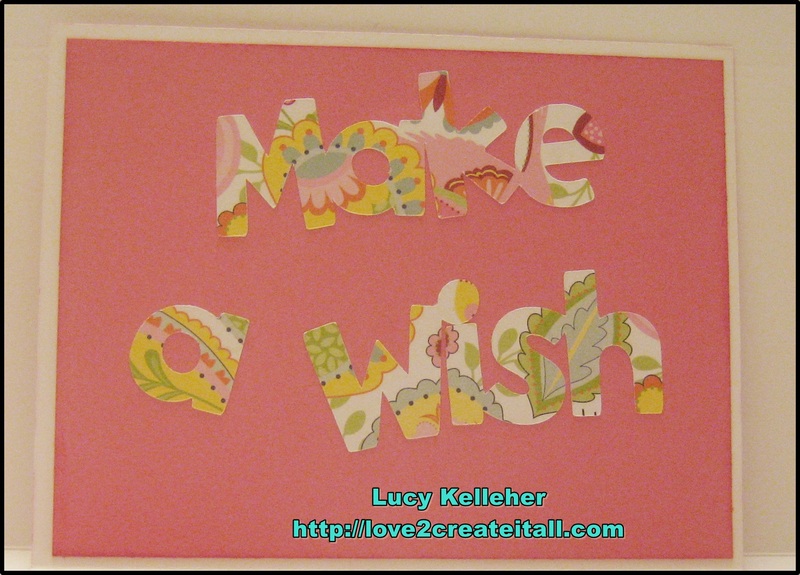 To make a card this large, I cut 2 pieces of 12 x 12 White Daisy cardstock: one at 9 1/2 x 12 and the second one at 10 x 12. I then scored the larger piece at 1/2″ and folded it over and adhered it to the first piece on the inside of the card using Scor-Pal double-sided tape. That adhesive really sticks well so I know the card will definitely hold up to 20 children signing it! The first layer of the card is Lagoon cardstock cut at 9 1/4 x 11 3/4. The second layer came from a paper pack called Claire from Close to My Heart and was cut at 7 x 11 1/2 using the Fit to Length key on the Cricut Expression. The image was on the Art Philosophy Cricut cartridge. It can be found on page 54, D4, < Rctngle2 >. The girl figure and the martial arts uniform were cut using the Everyday Paper Dolls Cricut cartridge. The “gi” or uniform is actually the bathrobe and belt on page 39 and the pants on page 40. The girl’s hair was on page 35. All were cut at 10 1/2″. For the letters on the side of the card I used Irresistibles Houndstooth Alphabet. This is a chipboard alphabet set that has a houndstooth resist pattern that shows through when you ink it. The letters were inked using Lagoon and Sunset ink. On the inside of the card, I used lettering from the Keyboard Kraft Alphabet which are adhesive-backed letters. 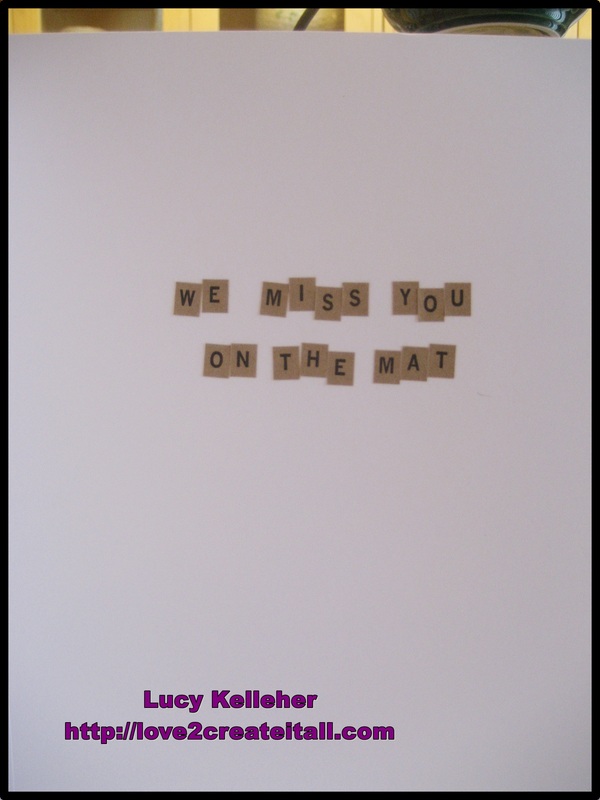 The sentiment reads “WE MISS YOU ON THE MAT”. I had a lot of fun making this card and hope that it cheers Tate up!! Please stop by my blog at Love 2 Create to see this and other projects I have made, just click here. If you would like to purchase any of the Close to My Heart products that I used, please click here.